So, you just flew first-class into Miami, and you’re looking to get around the city to get to that super-important business meeting of yours. You could hire a limo driver or just get a nice Uber to pick you up, but you’re not the type of cat that relies on people to cart you around town. No, you’d rather drive yourself, because you’re a cool, competent, motivated individual who gets stuff done and looks good in the process. You realize that you need to rent a car. However, a standard, bland, run-of-the-mill car rental company in Miami just won’t cut it. You know that all of the locals have fancy, exotic sports cars, and you want to blend in just like you live here. Luckily, our luxury car rental service at Miami Art Cars will get you where you need to be in style and pizzaz. If you’re still on the line about why you should go through with a sports car rental in Miami, however, check out some of these reasons. Though it is necessary to get a nice sports car to simply get from point a to point b, you might as well if there’s very little price differential, right? 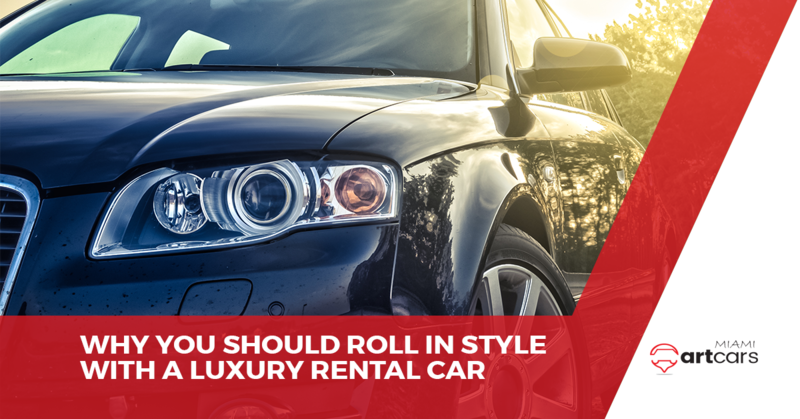 It all comes down to supply and demand when it comes to car rental – even luxury and high-end car rental. By picking the right day, booking in advance or even taking advantage of a last-minute deal, you may find that you’re paying little or even no more than you otherwise would for a lesser vehicle. With all of these economical, 50mpg enviro-boxes that are beginning to dominate city streets, we’ve lost the joy of exhilarating speed, acceleration, and handling. Sure, you don’t need to pretend that the Miami streets are the autobahn (we don’t encourage or condone reckless driving), but it’s nice to be able to quickly overtake that sluggish Prius in the left lane if you’re late to your super-important business meeting. At Miami Art Cars, we put the excitement back in driving with our luxury fleet. At least if you’re stuck in rush-hour traffic on the I-395, you can be the envy of the drivers that surround you. Admittedly, many drivers in South Florida drive exotic, fast and good-looking cars, but now, so can you! Even if you don’t stand out too much, you can still not look lame in comparison when you’re sitting next to a rusting 1998 Pontiac Aztek in your slick 424 horsepower Maserati Levante. Feel free to even give your engine a little rev to show who’s boss, because when you’re in Miami, you almost have to. That’s what our exotic car rental in Miami is here for. Exotic sports cars tend to be less-than-reliable, even if you baby them and don’t drive them very much. Luckily for you, our luxury fleet is well-maintained, our exotic rental cars are always fueled, serviced, cleaned, and ready for you to take the pedal to the metal. Since you’re not actually owning the vehicle, this means that you get to enjoy all of the benefits of luxury car rental goodness, without dealing with your Ferrari or Lamborghini suddenly bursting into flames (if you don’t believe that this happens, watch Top Gear). Let our exotic car rental at Miami Art Cars do all of the dirty work for you, while you get all of the good-looking, speedy benefits! At Miami Art Cars, our mission to is hook you up with a personalized, cool ride for you to enjoy your time in Miami. With our high-end car rental service, you’ll be smiling from point a to point b, knowing that you feel good driving and you look good doing it.